Crisp air feeding lungs, soul and heart with that smell that only autumn brings. Grey clouds or crystal blue skies loom above, unfurling their colours as a backdrop against the garnets and rusts of nature’s confetti that still clings to trees. Temperatures plummet and wind swirls picking up leaves already fallen from their home and turning them mini colourful tornadoes along sidewalks, paths and roads. As nature turns down and lays itself bare in hibernation for the winter ahead, so do our bodies, minds and hearts. Turning inward to observe our internal garnets and rusts of our emotional, physical, mental and spiritual confetti. We seek warmth and comfort as we too are laid bare on our journeys through this amazing life we each possess. We are reminded of the temporary nature of everything. The constant movement that surrounds us and that which resides within. And we breathe. That crisp air. How many times during our yoga practice on the mat do we move from one posture to the next…not really paying attention to that space in between, just looking forward to the arrival at the next expression of Adho Muka Svanasana or Virabhadrasana II? How many times in our lives do we move from one activity to the next, not thinking about how we got from here to there…driving from one location to the next and zoning out as we move along our designated path? This week, I am being intentional about my transitions. My yoga practice on the mat can teach me how to take more time in my practice of life off the mat – especially so in those periods of transition from one thing to the next. I’ve always been a person who likes to be on the move. I’ve moved over twenty times in my life, I love remaining active and busy, and enjoy being on the go. It’s often hard for me to sit still for any period of time and I am addicted to completing one task and then finding another to focus my energy on. Knowing this, I know it is equally important for me to take the time to slow down and focus on those spaces in between the activity. Those spaces between the action that I, in the past, have dismissed and rushed through. It is in those spaces and periods of time that I believe we can learn more about ourselves. How we really move, how we truly react, how our bodies feel – emotionally, physically, mentally and spiritually. In short, it gives us a moment to pause, reflect and listen. One fantastic way to begin this practice on your mat is with our regular Cat/Cow Warmup. Begin by coming into a tabletop position, wrists aligned under your shoulders and your knees under your hips (make sure you pad your knees up if you know you have sensitivities there!). On your inhale, drop your belly to the floor, tilting your low back up to the ceiling and lifting up and through your heart centre. You can lift your gaze to the ceiling. On your exhale, pull your navel into your spine and round through your back (almost as though someone has tied a rope around your waist and is pulling you up by it). Press through your hands and drop your chin to your chest, tucking your low back in toward your low ribs. Inhale, extend back into Cow. Exhale, round back into Cat. Continue this moving, allowing the breath to guide the movement, rather than the movement guiding your breath. How smooth can you make your transition from one to the other? Notice your natural inclination…is it to move quickly or slowly? Are you rolling through your spine? How is your breath in the transition from Cat into Cow? By taking the time with this simple exercise, we can better understand our yoga practice on the mat. Not only that, it provides insight into how we transition through things in our lives off the mat. Take a moment to reflect on this practice and notice if you want to make any changes. These small movements can be a window into the larger picture of our lives! 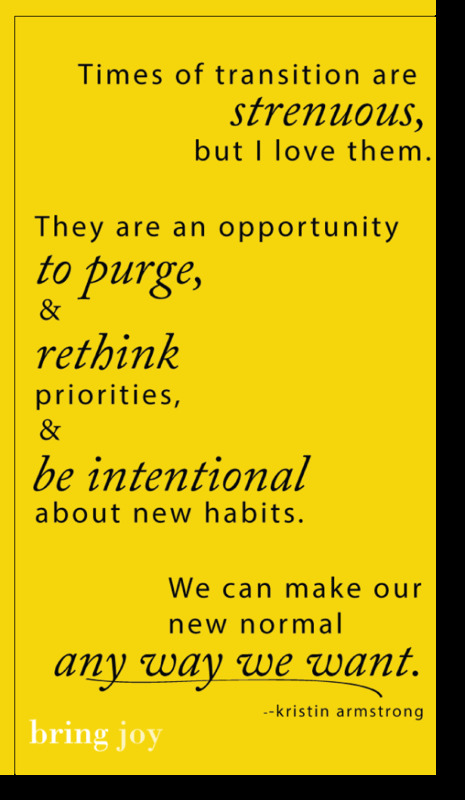 Be intentional in your transitions both on and off the mat…amazing things will follow! I am grateful for my soul. I am grateful for support provided to me in the form of words, hugs and love.